2.2.5. Dates and configuration of entries. 2.2.6. Final screen after the user fills the form. 2.2.8. Campaign stages and winners. 2.2.9. Dates and configuration of votes and comments. 2.2.12. Custom quesstions and answers (Quiz, Trivia, Tests...). 2.2.19. Make your campaign go viral. Our Cool Promo White Label application is the most powerful in our ‘Cool Promo‘ series. It provides you with a comprehensive platform for creating campaigns on social networks. You can read about all of its features on the page about the application. In this tutorial we will explain how to create a campaign that users can participate with their Facebook, Twitter, Instagram, LinkedIn or Google+ accounts and, moreover, that is published on a Facebook tab. To install this application, you have to go to “Your content” section and click on “Create content”. Select the “Applications” option and select Cool Promo White Label. Your users can also access anonimously if you choose that option. Name: This name that won't be seen by end users and will only be used in your administration section so that you can easily identify the campaign (Example:Christmas campaign for the shop). Tab name that will have in Facebook: It will be used as the tab name displayed on your Facebook. You can change it at any time, both from this section and from the Administration section of your Facebook page. Microsite: This is the option by default. An external URL: When you publish your campaign in your web or blog. The generic texts of your campaign are displayed by default in the language that the participant has configured on his/her computer, but you can choose to display it in the following languages: Spanish, Catalan, Basque, Galician, English, French, Italian, German, Bulgarian, Portuguese, Romanian or Russian. Password-protected campaign: This option allows you to restrict the campaign to users to whom you provide the code that you specify in this field. What are password-protected campaign used for? Check it out on this post: “Password-protected competitions and campaigns“. Title for the campaign: The name shown to users that visit your campaign. Campaign description: You can include some text to outline your campaign. It should be explanatory enough for users to understand how the campaign works. Thanks to our editor, you can give styles (font colors, size, etc.) to your text (it is not mandatory, because we already give styles to the text that you include to make them look good). In addition to text, you can add images or, if you have the knowledge, HTML too. Main image: The image that you use to present the campaign will be visible to all users. Campaign video: You can include the URL of a video you want to use to present you campaign in this field. It can be a URL from Youtube, Vimeo, Flickr, etc. This material is optional, but if you include a video in your campaign, keep in mind that it is the first thing that will be shown, unless you modify its placement using your own CSS. Use your own complete HTML for the landing/registration page (only for White Label campaigns). The main page and the participation form contain several default elements that you can modify or hide. Enable custom header for the entry form. You can add text, images or HTML that will be shown in the form header. Enable custom header for the entry form (personal data page in quizzes). You can add text, images or HTML that will be shown in the form header. Enable custom header for the entries page. You can add text, images or HTML that will be shown in the header of the participants list and the individual participant. Show a different content before the campaign begins. Show a different content after the campaign ends. Display custom content in the campaign winners page. Use your own complete HTML for the winners page (only for White Label campaigns). To complete the personalisation of our campaign, we set the default styles with a default background image and one of our custom themes, or use our own styles by customising all of the elements of our competition. To do this, we only need to activate the ‘custom CSS‘ option and have some basic knowledge of CSS to be able to completely customise the campaign. Remember it is not necessary to include the tags here. Time zone: You need to select the time zone in which you want the competition to be conducted. It is important to take care when setting your time zone because all of the dates that you are to specify below will be set in that time zone. If you make a mistake, you can modify it at any time. Campaign start date: The date from which your campaign will be visible on your fan page. 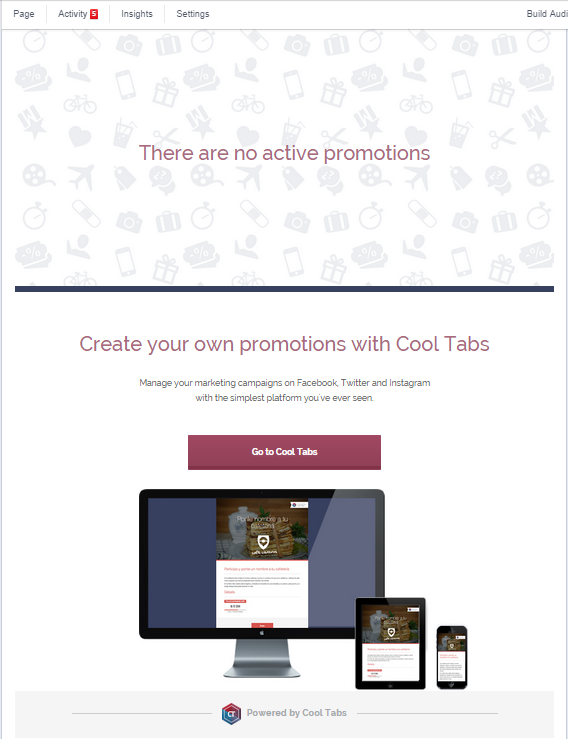 If you have already installed the Cool Promo White Label application on your page (i.e., a new tab already appears in the Applications section), but your campaign has not yet started, we will show a generic message that says ‘No active campaigns‘ (unless you’ve chosen other text or images to use before the start of the campaign). Campaign end date: The date from which your campaign will no longer be visible on your fan page. After this date, we show a generic message like the previous one, indicating that there are ‘No active campaigns‘. It is important to be careful when setting this date because once the campaign has ended, you may not modify it. Entries start date: Date from which users can start participating in the competition. Before this date, the ‘Enter’ button will not be shown on your campaign. Entries end date: Date from which users can no longer participate in the competition. After this date, the ‘Enter’ button will not be shown on your campaign. Enable public participation: All users can see who has participated. For competitions in which users need to vote on entries, this option must be enabled. This allows there to be a ranking of the participants with the most points or those with the most referrals. If this option is enabled, there will be a link to access the list of all entries so far on the campaign’s main page. For each entry, the avatar and name of the user who has participated will be shown, as well as the text/image/video corresponding to their entry. When you enable this, you have the option to set up the order of the participants in the public page by date, number of referrals, votes, quiz or virality score. If you don’t specify anything, by default, it will be sorted in reverse chronological order (the former participants at the end). In addition, you can choose if you want to show links in another way. Enable images gallery: This images gallery is used exclusively for photos and video contests with the idea of not showing the standard list of all entries one below each other. You will be able to choose the gallery has one, two or three columns. Enable moderation of entries: Enabling this option means that all entries will need to be reviewed by an administrator before they become part of the final list of participants. This is controlled through the participant administration panel in Cool Tabs. Block “prize-hunters” users: This option means that entries from participants who have been identified as fraudulent users through other competitions will be marked as pending moderation (even if the above option is no activated). Receive an email for each “prize-hunter” entry blocked: The administrator will receive an email notifying them of the entry and they can the decide whether or not to approve it. There is more information about our fraud control system here. Show the current number of participations: Enabling this option means that the total number of entries will be shown to all users in the “Details” section of the main page of the campaign. Participation from the following countries only: A way to limit your campaign to your country or a group of countries for this particular campaign or competition. This option is part of Cool Tabs’ new anti-fraud system. Standard message to all participants. This message will be shown to all participants who don't receive a custom message depending on socre, personality test or Instant Win. Message based on quiz results (quizzes with points or personality test) or based on the validation code used by the user. In quizzes with points, you can assign a message after participating according to the score obtained by the user. In personality tests, you can assign a message according to most answers chosen by the participant. If you want to calidate codes, you can assign a different message from each (or some) code. Assign a file that will be downloadable after participate. After participation, the user will be able to download this file. You can use this to delive coupon codes (the same for all the users), ebooks, etc. Automatic selection of with Instant Wins. Each participant will know immediately if s/he has won or not. The application will choose only one random winner throughout each stage of the campaign. Do not forget to fill in the field "Custom message for users who have won an Instant Win" in the section "Campaign design". Each user can only enter once: The most common option for campaigns and competitions. Users can enter as many times as they like: Unlimited entries. Users may participate once or several times in the time period that you define: If you choose this option, you must then define how many hours each phase of your competition lasts (1 day = 24 hours, 1 week = 168 hours, etc.) and the number of times it is possible to participate in each phase. Automatic selection of random winners: You can decide whether or not you want winners to be selected automatically. If you decide to go for this option, you won’t need to access Cool Tabs and do it manually. Instead, if you tick this box, the application will automatically do it for you at the end of every stage (if you have created a competition with stages) or at the end of the competition. If you choose winners to be selected automatically, you will have to select the number of contest winners and substitutes to be selected at each stage or at the end of the contest. When choosing winners exclude participants who have already won a phase in contest: This option prevents the same winner of one stage is repeated. The page including the list of winners will be public and participants will be able to see it: You can choose the option to publish the winners and substitutes’ names on the application page. You just need to tick this box. Instant Win: This option allow you to select a random instant winner during each stage of your competition. Winners are picked automatically with Instant Win and the participants in your competition will know immediately whether or not they have won and will not have to wait for a specific date and time for the results to be announced. The most important thing when creating anInstant Wincompetition is to remember is that there will be one winner per stage and that you therefore need to create as many stages as instant winners you want to have. How many users do you want to participate in your campaign? (Leave blank for unlimited): You can set a maximum number of entries for your campaign or competition. Once the limit is reached, users will not be able to participate (the ‘Enter’ button will not be shown). Normally this option is used to give something away to the first users that take part (samples, concert tickets, etc.). Leave this field blank if you do not want to set any limits. Enable voting for entries: Activate the voting system for the entries in your competition. Users can view the entries and vote just once per entry. Do not forget to enable public participation in the previous section. Voting start date: Date from which users can vote on entries. Users must provide their email address to be able to vote: This option should be enabled when you want to collect the email addresses of people who vote in the competition. If you are creating a campaign based exclusively on votes (entries are closed and it is the administrator who has created a list of 4 or 5 entries for fans to decide which is the best by voting for them), you will be interested in collecting the email addresses of people who vote to be able to contact them when the winner is chosen. When the user installs the Facebook application to vote, they will be asked to grant permission to access their email address. It is an automatic process and the user will never have to manually enter their email address. Limit the number of times a user can vote through the campaign: If you do not enter anything in this field, the default is that users may vote only once for each of the entries in the competition. However, if you are running a “choose your favourite” campaign where users participate by voting, you can use this field to indicate that they can only vote once or as many times as you need, depending on how your competition is set up. Show to all users who has voted for each entry in the competition (their avatar and name will be displayed): If this option is enabled, the users that voted for each entry will be shown on the individual page of each entry (not in the list of entries). Only the Facebook avatar and user name will be displayed. Voting from the following countries only: A way to limit your campaign to your country or a group of countries for this particular campaign or competition. If you have restricted entries, we also give you the option to restrict the voting. It is part of the Cool Tabs‘ new anti-fraud system. Block voters from possible vote exchange networks: Thanks to a database we have developed monitoring all competitions created with our applications, we know what users could belong to exchange networks.So if you enable this option, when these users try to vote, the message of “invalid vote” will appear. Also you can see which participants are receiving votes of this type, so you know if they have tried to make use of networks for exchanging votes to win. Blocking fraudulent votes: This option means that voters that have been identified as fraudulent cannot vote. It appears as invalid. There is more information about our fraud control system here. Minutes to block votes from the same IP address: If you complete this field, users cannot vote from the same IP address until the number of minutes indicated has elapsed. As we indicate on the form, many offices, universities, etc. use the same IP addresses, so if you decide to block votes from the same IP address, it is recommended that it is only for 5-10 minutes. Allow comments on the entries: It is a good alternative for ranking by points competitions, as you can give points for receiving comments on your entry. It is also a way of getting feedback from users about different entries. Comments are active for the same date range that has been set for votes. Allow a user to make more than one comment on the same entry: It can help to generate dialogue between different users. However, if we give each entry points for every comment received, it could result in an infinite number of comments with no other purpose than to gain points, so we need to think about the best setup to use. This section is key for a ranking by points competition or for any competition where the score is one of the considerations for deciding the winner. To earn points, the participant has to perform a series of viral actions that will help increase the visibility of the brand on Facebook. Now is when we set up the form that users need to complete to take part in our campaign. Depending on how we set up this form, we can create competitions to have questions/answers, photos, videos, etc. The basic form always includes three mandatory fields: First name, surname(s) and email address. The user must input their birthday to participate: Activate this field if you want users to fill in their birthday to take part in the competition. Remember that if it is enabled, it will be mandatory for users to enter these details. The user must input their identification document details to participate: If you need participants to provide identification document details, you should activate this field. The user must input their telephone number to participate: Enable this field if you want the form to include a field for users to enter their telephone number. If it is activated, it is mandatory to complete the field to participate. The user must input their gender to participate: Enable this field if you want the form to include a field for users to enter their gender (Male/Female). If it is activated, it is mandatory to complete the field to participate. The user must input their postal address to participate: This is very useful for sending the prize or to send any advertising to participants through the post, as long as you specify this in the terms and conditions. The user must input their postal code to participate: This is very useful to know the location of the participants. The user must input their country to participate: Enable this field if you want the form to include a field for users to enter their country. If it is activated, it is mandatory to complete the field to participate. The user must input their region to participate: Enable this field if you want the form to include a field for users to enter their region. If it is activated, it is mandatory to complete the field to participate. Activate a drop-down menu with Spanish cities: Enable this option if you want the city field to be a drop-down list of Spanish provincial capital cities instead of a free text field. The user must input their city to participate: Enable this field if you want the form to include a field for users to enter their city. If it is activated, it is mandatory to complete the field to participate. A question must be answered to take part: Enable a question in the entry form that users need to answer if they want to take part in your competition. Text, question or comments to complete: If you want users to participate by answering a question or providing a text, you need to indicate here what it is that they need to provide (Example: “What were your best ever holidays?”). Display a Word text field: This option is useful to allow users to add longer texts. This field is only available for this application and is especially useful for competitions involving stories, recipes, etc. The title or question that you want to appear above this extra text box: We need to specify exactly how we want to use this extra text field (Example: “Add your recipe here”). An image must be uploaded to take part: Enable images in entries so that users can take part by uploading a picture. Title for the image: It is the text that users will see in the form to prompt them to upload the image (Example: “Upload your best birthday photo”). Is it mandatory to upload the image to take part? If you enable this option, it is mandatory to upload an image to take part in the competition. Users can upload multiple images at the same time: Participants can choose multiple images when they click on the Browse button and participate with multiple images. The selected images will be attached to the entry form. A video must be uploaded to take part: Enable videos in entries so that users can take part by including the URL of a video (Youtube, Vimeo, Flickr, etc.). Title for the video: It is the text that users will see in the form to prompt them to upload the video (Example: “Add the URL of your best birthday video”). Is it mandatory to upload the video to take part? If you enable this option, it is mandatory to upload a video to take part in the competition. Enable additional checkbox on the entry form: This option is ideal for encouraging users to subscribe to your newsletter or for them to allow you to send them campaigns or offers, etc. Opt-in checkbox: Enter a title for the extra checkbox on the entry form. (Example: “I wish to receive emails with offers and campaigns”). Mandatory to accept the additional checkbox: If you activate this option, users will have to accept this additional checkbox to take part. 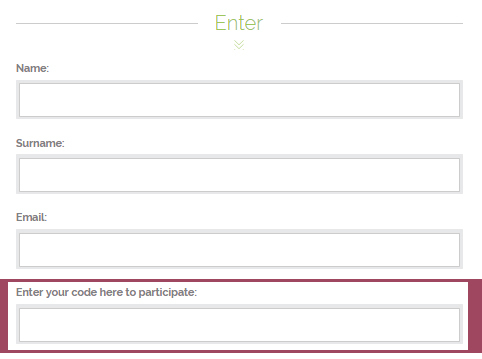 Time limit to complete the form: Do you want to give participants a time limit to answer questions that you ask them? In this field, you can include the maximum amount of time (in seconds) that people will have to complete the form. If they take longer than the specified time, their entry will be marked as pending moderation for you to later decide whether to approve it or not. If the participant closes the window and tries again later, they cannot participate if the maximum amount of time has already elapsed. This way you limit users being able to go and find the answers and make them have to answer within the time given. Enable custom header for the entry form: You can include text, an image or a video with HTML at top of the entry form that you have just set up. This section is for including several personalised questions in your competition. The questionnaire can be organised in a variety of ways depending on each campaign: There can be random questions for each participant, or it can be a series of questions scheduled for certain dates, points given for answering correctly or dividing the answers into categories. Display every quizz questions on a single page: If you check this option, the entry form and the questions you set in these section will be displayed on a single page. If you do not check it, the questions will be displayed one on each page, with buttons to continue to the next question. Show users’ responses to all: Enabling this option means that responses marked as ‘public’ will be shown to everyone. It is usual that responses where creativity or participant opinion is required are made public, but not those that involve answering something correctly. Give points for each correct answer in the questionnaire: This option allows you to assign different scores to each question answered correctly. Show own score to participants: Participants can see the total number of points that they have in your questionnaire. Show scores publicly: If you enable this option, any user can see the scores of any participant. Number of random questions: This way, you can select a set of questions and decide how many of them will be asked to each participant. The application will randomly select the number of questions you wish. This will allow you to create a different participation quiz for each participant in the competition. Each question may or may not include a picture and it may or not be mandatory to answer. It is mandatory to answer this question: If you activate these checkboxes, it will become a prerequisite to answer the question to complete the entry. If you don’t activate them, users can submit their entry without responding. Answers to this question will be public (visible to everyone): You can decide whether each response will be made visible to everyone or not, since there may be information that you do not want to be visible to everyone (for example, personal details, or the correct answer to a question that is asked of all entrants). Show this question on the form between certain dates only: If you are creating a competition that is to be split into phases or if you just want certain questions to appear only on the entry form on certain dates, you can configure that in this section. Give points for answering this question correctly: If the question you are setting has one correct answer, you can assign a score to respond properly. The score may be different for each question by value or difficulty. Text written by the participant. Answer chosen from various options. Multiple answers (the user can choose one or more answers). Stars rating from 1 to 10. Type of response: This option allows you to sort the responses into categories. This means that if a participant chooses more responses from type A, we could show them a message after they send their entry that is different to the message that we show to participants that have given more type B, C or D responses. This custom message for each category can be set in the “Campaign design” section. Is it a correct answer to the question? You can indicate what is or are the correct answers for each question, except for the text written by the participant. This is because there is no correct answer due to there being the freedom to respond in many different ways. If this option is chosen, the user will know whether or not they have answered correctly and the competition administrator can also see it in the participant report. Moreover, you can display a different message to those participants who have successfully answered the questions facing those who have not. The participants who have answered everything right will see the “Personalised message for thoseparticipants that correctly answered the question” after participating, while the other participants will see the “Standard message to all participants“. Both messages can be created in the “Campaign design” section. Add another question: You can add all the questions that you need with or without images and with different types of responses to make the questionnaire as dynamic as possible. For more information and examples about this section, you can read this post: Quiz for the campaign. You can configure here the different paths and forks for your quiz with different conditions and positions. This is the most important part for competitions where the purpose is to give a personalised coupon or a code for a gift to your participants. This section is for competitions with the opposite setup to the previous section. That is to say that instead of giving discount coupons to participants, they have to validate codes that they have received from the online shop, the physical shop or by email to participate. Add your own terms and conditions. By selectiong this option we'll include a link with your promo legal conditions. Terms and Conditions text: It is the text for the competition’s terms and conditions. With our editor, you can style and format your terms and conditions. They are displayed in a pop-up when a user clicks on the ‘terms and conditions’ link. Here is a template that you can use to populate with data from your competition (ES). Activate a check-box with additional conditions: This is the ideal option if you want to encourage your consumers to subscribe to your newsletter. Setting up a hashtag for Instagram allows us to share our competition on this social network too. It doesn’t make sense for all competitions, but it is an option that we can use to raise awareness of our campaign. Question to users so that they write the tweet with which they will participate: This text will appear above the field to tweet. If you do not write anything, it will not be mandatory to post a tweet to participate. Text that appears in tweet when a user shares this campaign on Twitter: In this field we can set up how we would like our campaign to be shared on Twitter. Think of 140 characters to attract tweeters to our competition or campaign. Twitter user that the participant must follow: Users who participate in your campaign with their Twitter account must follow the account you specify in this field. If you do not want to be mandatory follow any account, leave this field empty. Twitter hashtags to automatically collect entries (up to 4, separated by spaces or comma): As in theInstagram section, this field allows you to include custom hashtag or hashtags so that all tweets that contain them will be automatically shown in your list of participants, either directly as entries, or as ‘pending moderation’ if you enable the next option. Pre-moderate tweets collected by hashtag: The tweets with your competition’s hashtag will be collected as potential entries and you can choose whether or not to accept them (they will appear as ‘pending moderation’). If you decide to accept these entries, you need to consider the fact that you will not have the email addresses of these users and that they have not accepted the conditions of your Facebook So, if you want to contact them, you must do so through Twitter by direct message or by mentioning the user in a tweet. As soon as one participant joins the cmapaign, we will send its data to any service you want. Suggest your participants to like your Facebook page / several Facebook pages, Twitter, Instagram and/or Pinterest profiles: It is no longer possible to make it obligatory that participants become fans of your Facebook page to be able to participate, but if that is what you want, you can recommend your fan page or other Facebook pages (or your profiles on Twitter, Instagram and Pinterest) to them. This option is usually very effective, because users participating in your campaign generally want to keep up to date with the company’s latest news, or at least to anything related to the campaign or competition. What profiles do you want to suggest? : Your can recommend one or more Facebook pages, Twitter, Instagram or/and Pinterest profiles. Write the text you want to appear to convince your participants to follow your social profiles when they want to join your contest: You can customize the text that appears at the top of the pop-up, trying to encourage uptake. Suggest to voters that they like your fan page / several fan pages, Twitter, Instagram and/or Pinterestprofiles: It is no longer possible to make it obligatory that voters become fans of your Facebook page to be able to participate, but if that is what you want, you can recommend your fan page or other Facebook pages (or your Twitter, Instagram and/or Pinterest profiles) to them in the same way as for the participants in the previous section. Write the text you want to appear to convince your voters to follow your social profiles when they want to join to vote: You can customize the text that appears at the top of the pop-up, trying to encourage uptake of voters. Image to display on users’ Facebook wall when they click on ‘Share’: Image to be used on users’ wall posts. Title to display on users’ walls when they “Share” the competition: It is the title of the post that is created when a user clicks the competition’s ‘Share’ button (not for an entry). Text to display on users’ walls when they “Share” the competition: It is the body text of the post that is created when a user clicks the competition’s ‘Share’ button (not for an entry). Title to display on users’ walls when they “Share” their participation: It is the title of the post that is created when a user clicks the competition’s ‘Share’ button for an entry (not for the competition). Text to display on users’ walls when they “Share” their participation: It is the body text of the post that is created when a user clicks the competition’s ‘Share’ button for an entry (not for the competition). Text that appears in tweets when the users share your campaign on Twitter: This is the text that appears by default in the tweet to share the contest. Text that appears in tweets when the users share their participations on Twitter: This is the text that appears by default in the tweet when users share their participation in this social network. Twitter user to associate with the tweets generated by the campaign: The user specify here will appear as owner in Twitter Cards or tweet summary. This subsection appears only when you have configured different categories in the section “Add a questionnaire or survey to your competition” so that when users share their participation, their result is displayed. Very useful for personality tests. Here we can decide what will be displayed when participants share the results of their personality test on Facebook and Twitter. The best thing to do is to add a photo related to the character / artist / musician / etc. for each category and also mention who it is in the title, which will encourage more users to take part. The description can be used to describe the character / artist / musician / etc. in an original way to try to attract curious users. This is especially useful if you want to embed your campaign on a website, as you can track the visits through the Google Analytics tracking code. Usually, we include a new tracking code to monitor the visits to our campaign, but if you embed your campaing on a web, it would be also interesting to include that website's tracking code. Keep in mind that each quizz's page will count as a viewed page. From the moment you set up your Google Analytics code, we'll start to send all the visits that your quizz gets to your own tracking code. Tracking code: In this field you can include the code you usually use to track your content or campaigns. Just copy and paste the tracking code or pixel as it’s given by your provider and we add it on every page of your campaign at the end, just before the tag </body>. Now, we click on ‘Save’ and we have already finished setting up our campaign. Before publishing your tab, you can see what the final look of the screens that make up your campaign will be. Access it by clicking on the ‘Preview’ icon in the Cool Tabs panel or when we finish setting up the campaign by clicking on ‘Save and preview‘. In the preview, we can see what our campaign will look like on the Facebook page. It is possible to navigate to see how it will appear on different dates (before the start of the campaign, opening date for entries, etc. ), we can see the final setup of our entry form and, if enabled, we can even see the image that is shown after participating. Also, on the side panel, we can change the template, the name/title of the campaign, the main campaign image and the language. We can also participate in the promo as administrators or return to the editing page. Furthermore, in the side menu of the preview, we can see the option to generate the URL for the preview for customers. With this URL, your customers will be able to see the campaign or competition you’ve set up. At this point, you will have set up your campaign, seen how it looks so that you can make the necessary adjustments, and shown it to your customer, if applicable. Now all you have to do is publish it. If you want to learn how to publish in the White Label version, read the following tutorial: Publishing a White Label Campaign. Remember that you can publish your campaign in a Facebook tab or not. If you do not post it on Facebook, we will provide a minisite with your campaign.